¿Qué sucede cuando nos sentamos a comer en familia? 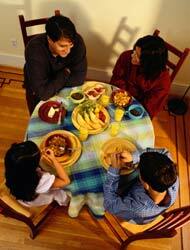 1 Parte / What happens when we sit down to have dinner with our family? ¿Te has puesto a pensar lo que ocurre cuando tenemos el hábito de sentarnos con la familia para comer? Recuerdo las comidas en mi casa. Había peleas, risas, regaños, lágrimas, enojos, recuerdos, sorpresas, aveces eran aburridas… en fin, cada día era diferente. Los hábitos son muy importantes en la vida de los niños; de hecho se consideran necesarios para fomentar el autoestima de tu hijo. Una mamá me pregunto: ¿cómo podría fomentar el autoestima de mi hijo? Le respondí que una de tantas formas es el hábito de sentarse a comer en familia y que, por el ritmo de vida actual, se está perdiendo. Llevando a cabo esta sana costumbre puedes mostrarle al niño que es tan importante para ti que tienes tiempo para estar con él y con la familia. Olvídate el teléfono, la televisión etc… Sé que muchas veces por el trabajo es complicado, pero busca un día, una hora, unos minutos para estar todos en familia. Desde pequeños, cuando los sientas en su silla, cuando les pones el babero, su plato y su cuchara les estás inculcando el hábito de comer todos juntos. Cuando ya caminan solos y tienen capacidad de comprender algunas indicaciones puedes pedirle que te ayude a poner su plato, más adelante a recoger la mesa, etc… De esta manera aprenderán valores como la colaboración. Puedes decirle con cariño: “Qué bien pones la mesa, me encanta que me ayudes, tenía tantas ganas de llegar a casa para pasar tiempo contigo”. Estas palabras edificarán la vida de tu hijo. Llega un momento en que los bebés empiezan con la “pinza”, que yo llamo la etapa “aspiradora” porque todo lo pequeñito del suelo lo recogen y se lo llevan a la boca. Aprovecha esta etapa y ponle migajas en la mesa para que las recoja y verás que estará sentado y entretenido mucho tiempo, mientras los otros integrantes de la familia terminan de comer. Esto le ayudará para que más adelante pueda coger correctamente los cubiertos y, posteriormente, con la escritura. A los niños les encanta ir haciendo cosas por ellos mismos. Motiva a tu hijo poco a poco a ir comiendo solo. Cuando le estés dando la papilla/ potito dale otra cuchara, más adelante el se servirá agua en su vaso, cortara su comida, etc… No le quites la oportunidad de que vaya experimentando sus primeros logros. El libro “La familia”, de Pep Bruno y Mariona Cabassa, nos cuenta la rutina de una familia que se levanta, desayuna, se van al trabajo los padres, el niño a la escuela y en la tarde los tres integrantes de la familia se reúnen a merendar unas ricas magdalenas y se van a ver su espectáculo favorito. Buscan el tiempo para estar en JUNTOS en familia. 1. Entrégale a cada niño una magdalena y un cuenco con el chocolate derretido. 2. Dale una cuchara a cada uno y que solitos decoren su magdalena con las bolitas de colores. Tener tiempo para comer en familia será una gran oportunidad para que tu hijo se sienta IMPORTANTE, QUERIDO y VALORADO. What happens when we sit down to have dinner with our family? Have you ever thought about what happens when we make it a habit to sit down at the table to have dinner with our family? I remember the dinners at my house: arguments, laughter, being told off, tears, memories, surprises, sometimes they were boring… every day was different. Habits are very important in the lives of children; in fact they are considered necessary to develop your child’s self-esteem. One mother asked me: How can I encourage my child’s self-esteem? I answered that one of the many ways to do this is the habit of sitting down to have dinner together and that, because of the pace of modern life, we are losing this habit. By carrying out this healthy habit, you can show your child that it is very important to you to spend time with him/ her and with your family. Forget the phone, the television etc… I know that a lot of the time it is difficult because of work, but find a day, an hour, minutes for your family to be together. From when they are small, when you sit them down in their high chair, when you put on their bib, you give them their plate and their spoon, you are getting them used to eating all together. When they can walk by themselves and they are able to understand instructions, you can ask them to help to put their plate on the table and later on to lay the table, etc… That way they learn values such as teamwork. You can tell them very kindly: ‘Good boy/ girl, you laid the table, I love it that you help me, I was really looking forward to coming home and spending time with you’. These words will improve your child’s life. There comes a time when babies begin with the ‘tweezer’, what I call the ‘vacuum cleaner’ phase, because they pick up every little thing from the floor and put it in their mouths. Take advantage of this phase and put crumbs on the table so that they pick them up and you will see that they will stay seated and be entertained for a long time, while the other members of the family finish their dinner. This will help them later on to pick up their knife and fork correctly, and later, with writing. Children love to do things on their own. Motivate your child to, bit by bit, eat on its own. When you are giving him his food, give him another spoon, later on he will serve his own water, cut his food, etc… Don’t take away the opportunity for it to experience its first achievements. The book “The family“, by Pep Bruno and Mariona Cabassa, tells us about the routine of a family that gets up, has breakfast, the parents go to work and the child goes to school and afterwards the 3 family members come together to have some nice cupcakes and go to their favourite show. They find time to be together as a family. Give every child a cupcake and a bowl of melted chocolate. Give them a spoon and let them decorate their cupcake themselves with the hundreds and thousands. Taking the time to sit down and have dinner as a family is a great opportunity for your child to feel IMPORTANT, LOVED and VALUED.